Strong, sturdy hardwood bunk beds, loft beds, student beds and student dorm loft beds. Free Booklet on safety standards. Direct Volume Discounts. Dealers Welcome! 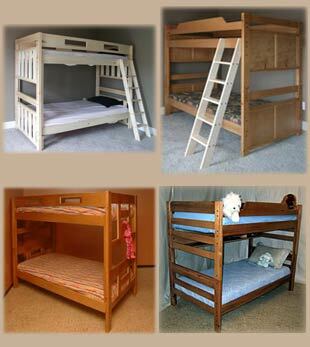 Hardwood furniture for children and college kids which include bunk, loft, and twin beds. Offers hardwood furniture, loft and bunk beds for kids and adults. Riddle specializes in hardwood bunk beds, bedroom furniture, loft beds, dressers and desks. 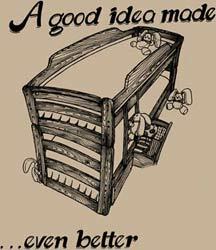 At Riddle Furniture we take great pride in in the quality of our bunk beds, loft and bedroom furniture. Our entire kid product line is 100% solid hardwood. Riddle products offer many new and innovative features. Our goal is to deliver a high quality twin product that does not effect our prices. Please check our prices to see the value! The benefits of Riddle Bunk Beds is quality construction, and straight-forward assembly. We also have beds forcollege students are going to dorm at their respectable universities. Our Bunk Beds are manufactured to comply with the Federal Regulation Code 1513 Consumer Product Safety Commission. We are located in Aldergrove, British Columbia, Canada just a short distance from the Canada/US border in Washington State, USA. Traditionally we have sold our products to large and medium sized retailers throughout North America. We are now offering our products factory direct which offers you considerable value. Cheap discount full size desks for sale. Riddle Manufacturing has been manufacturing quality hardwood furniture and child beds for over 20 years. We are confident that you will enjoy our quality built solid wood product for dorm students and hope your satisfaction and realization of good value will facilitate word of mouth orders around your area through friends, relatives and neighbours We also provide for our customers the option to choose full or queen size beds. There are quite a lot of beds that you can purchase at a discount price. You can find various cheap bunk or full size beds that fit your budget range. Most low bunk beds look like they were made from packing crates, but yours has lovely curves in the upright supports and beading on the headboards. We appreciate the time and care you took with design for our desk. Mr. Juker took our order on Christmas Eve and was gracious as could be. Not to mention that the price was far, far lower than anything we found locally or elsewhere on the Web. The low price actually made me a bit suspicious, but we are so happy we bought from Riddle. There are a lot of beds for sale that you can find throughout our site. We just wanted to tell you how pleased we are with the girl bunk bed we purchased from you. We were a bit concerned about purchasing the the color of the white bed did with out seeing it ourselves. Riddle Manufacturing has been manufacturing quality hardwood furniture and bunk beds for over 20 years. We are located in Aldergrove, British Columbia, Canada just a short distance from the Canada/US border in Washington State, USA. Traditionally we have sold our products to large and medium sized retailers throughout North America. We are now offering our products factory direct which offers studentconsiderable prices. We are confident that you will enjoy our quality built furniture wood product and hope your satisfaction and realization of good value will facilitate word of mouth orders around your area through friends, relatives and neighbours. 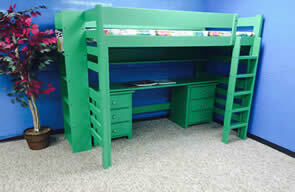 Also we offer adult size bunk beds for all types of custom sizes to choose from. We take great pride in the quality of our bunk beds, loft beds and bedroom furniture. Our entire product line is 100% solid Maple, Alder and Aspen hardwood. No ply, particle or fiberboard is used in the production of our beds! Each bed frame is built solid for adult or child use, with solid upper middle bunk supports for double beds. Our bunk beds are very sturdy. Our safety rails are single long pieces, in addition to being 14" deep for extra strength and safety. Remember, we do Extra-Long bunk beds. Our product line offers many new and innovative features. Our goal is to deliver an excellent priced product without compromising with the quality. The benefits of Bunk Beds by Riddle are quality construction, and straight-forward assembly as we supply pre assembled head boards with minimal other pieces to assemble. For Canadian price listing, please click on the Canadian flag. Different heights available for Bunk Beds & Loft beds! All depends on the height of your ceiling. selling all kinds of mattresses and foams.Also Single XL, Double XL and Queen. We specialize in, Maple, & aspen hardwood bunk beds, bedroom furniture and loft beds. We do extra-long bunk beds! Our Bunk Beds are manufactured to comply with the Federal Regulation Code 1513 Consumer Product Safety Commission.